Not really a sensible time to go track bashing, given the limited daylight, but ADL were running a trip from Düren with sensible amounts of track on it so I built a long weekend round it. Very early start (after massive quiz defeat the previous evening) to check in for 0530 at BHX. [Those with the patience to stick with me will find that massive quiz defeats seem to precede many of my trips...] Why do you have to check in at 0530 for an 0700 flight? Flight (in 737-200) was on time despite being stacked at Brussel because of fog. Breakfast was poor - orange juice, yoghourt, ham and tomato roll and tea so revolting I had coffee for the second cup (serves me right for not switching to Continental mode soon enough). Brussel was still foggy on arrival - first thing visible through the cloud was the airport boundary fence. Luggage arrived at the carousel just as I did, so plenty of time to debate the fare options with the SNCB/NMBS booking clerk. Weekend return to Verviers plus open return Verviers-Aachen proved an economical option at BFr 1050 (610+440) as compared to Eupen at 700 and 2x100 bus fares. Less than 3 quid extra for a substantial gain in time. The first loco seen in Belgium was a non-required electric, the second was 8055, my last Schaarbeek shunter so a good start. A zero minute cross platform connection was made at Brussel Noord into 0956 Welkenraedt on the principle that there might be a connection forward to Aachen from Verviers and if not, it was probably a nicer place to wait than Derby, sorry, Brussel Noord. No connection was forthcoming so a ten minute stroll into Verviers was rewarded with a Leffe Brune plus salted and peppered cheese. [Bizarre Wallonian habit, ruins perfectly good, nay excellent, cheese] The 1220 to Aachen (1056 ex Brussel Noord) had a mixture of old and new IC stock but there was room in the new non-vinyl section. And - shock, horror - an Oostende - Köln train was on time. Perhaps the Thalys trains have now taken on their timekeeping mantle. Mettmann is much reduced - now single line with the loop secured out of use and only the former eastbound platform in use. Yard is lifted. In snow and poor light impossible to tell whether freight traffic is still passing east of Mettmann (though according to Ball the line is OOU for part of the way). The branch is quite scenic, hilly and wooded. 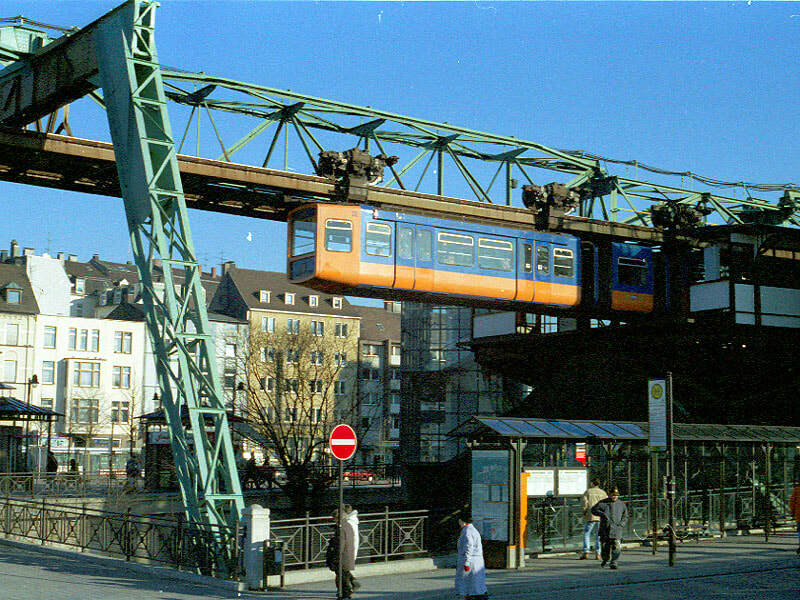 It climbs most, if not all, the way to Mettmann station. It also goes through Neanderthal (commemorative phot taken through train window in very poor light). S-Bahn Düsseldorf - Neuss on an S11 to Bergisch Gladbach. At Neuss I was able to elicit that the day ticket covers the whole Rhein-Ruhr area which makes it good value and worthwhile using on Monday. [Presumably it was a VRR tageskarte] I'm writing this at 1705 sitting on 1708 to Kaarst: light is failing fast and photography looks very doubtful even at 1716. Technical daylight OK though! In fact it lasted well enough to finish a film with a shot of Kaarst at 1/60 and f1.8, propped up on a steel railing and probably wildly out of focus. 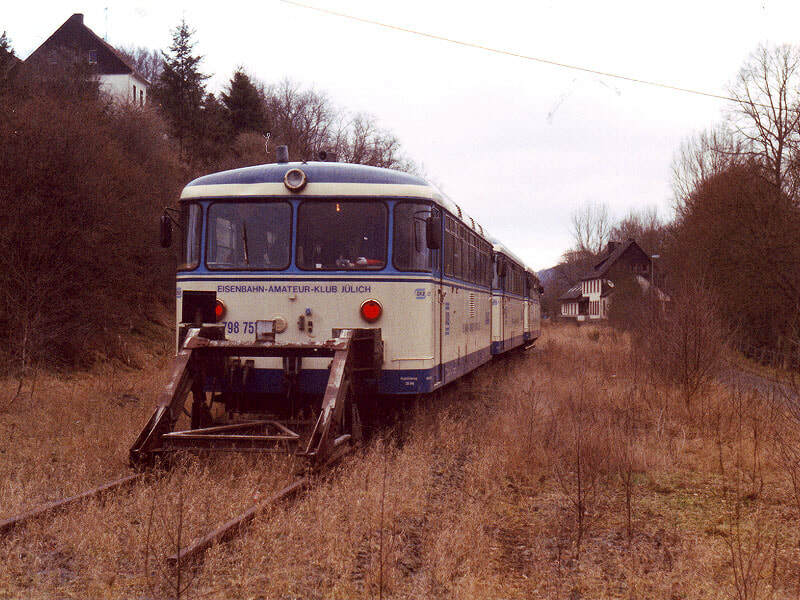 Kaarst is a simple single platform terminus - track used to continue beyond [to Viersen] but has been removed. Returning to Neuss it became obvious that no more daylight gricing was possible so I decided to go back to Aachen via MG. Evening was occupied with a shower, then a huge helping of roast pork and two weissbiers at the Aachener Brauhaus. A miserable, sleety, foggy morning, which made it a very dull run up to Euskirchen especially as it was the second time in a few months. Snow was in evidence in varying degrees around Euskirchen and for a lot of the route thereafter. Very scenic from Euskirchen all the way until the light ran out at Mayen. A request to go to the buffer stops at Pronsfeld was complied with. 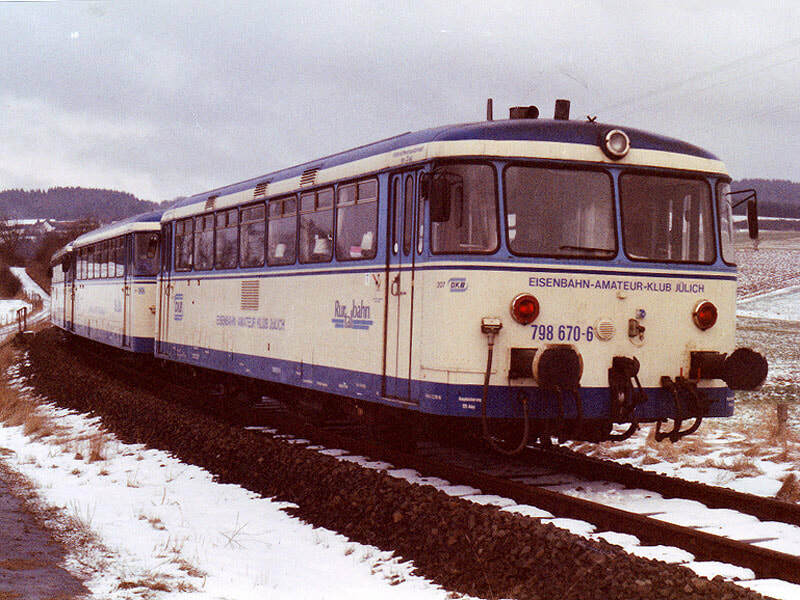 The EAKJ Ferkeltaxi and trailers in the snow at Schwirzheim on 31.1.98. The fearsome gradient profile of the whole Pronsfeld - Mayen route (ruling gradient 1 in 40) didn't seem to bother the unit though it had only 2x150 hp engines for the power car and two trailers. It was refuelled at Daun on the way, er, down. Food had run out by 12 noon and the organiser seemed fretful about this despite partial restocking en route. Having originally said that the photo stops on the way back from Pronsfeld would be abandoned to get maximum use of daylight, we stopped at Monreal to see if an adjacent restaurant would accommodate us. Fortunately it wouldn't so we proceeded in very technical daylight to Mayen Ost where around 100 railtour patrons descended on a nearby McDonalds. Luckily the weather was clear and bright during the afternoon so we had just about had daylight to the start of the passenger section at Mayen West. [thus vindicating the organiser! And of course you can now travel to Kaisersesch on a routine passenger service]. The 2150 went at a crawl until after Horrem, reasons still unknown, and on arrival at Düren it collected some more ADL patrons. Seemingly it also delayed the main ADL party, whose Jülich train was held for the connection (it was to make a special stop to set them down at a level crossing near the Etap hotel). The run from Düren to Aachen was normal and final arrival was about 15 minutes late just after 2300. The Aachen station buffet obligingly opens at 0700 even on Sunday so plenty of time for breakfast before the (delayed) 0744 to Horrem which appeared to be waiting connections. At Horrem the 0848 was waiting in the Bedburg branch platform, fortunately as it was very cold. It turned out to be a DKB RegioSprinter and provided welcome warmth for a 15 minute wait. Changing at Neuss Hbf a punctual arrival was made at Krefeld Hbf and a hotel room secured for the night. After a fracas with a local cash machine I was able to get the 215 hauled, steam heated 1050 to Kleve for an hour on one of Europe's most boring branch lines. 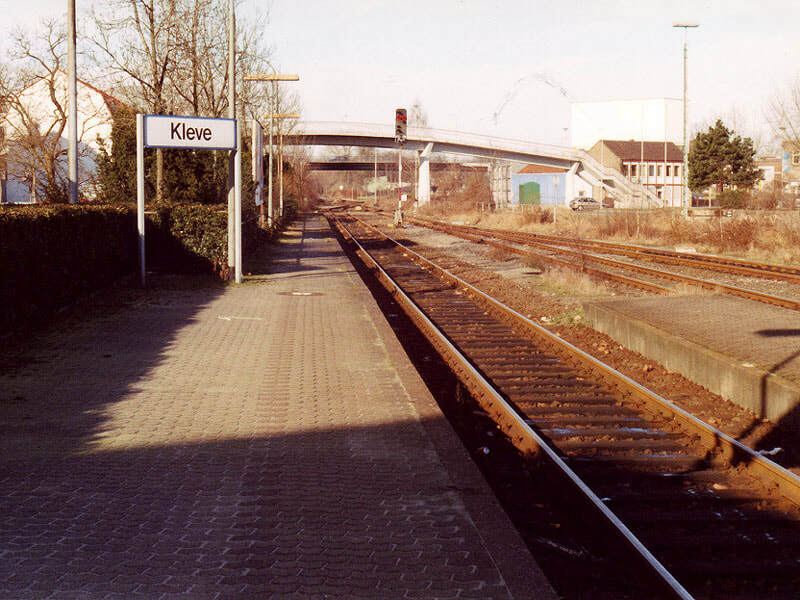 Kleve (one of the old signs on the station says Cleve) is the terminus but has track disappearing beyond, presumably to the Netherlands originally. [Nijmegen, in fact] There was some evidence of freight traffic (well, two wagon loads of tree trunks at Goch). Semaphore signalling is much in evidence. The three minute, apparently unbooked, connection at Krefeld on the return turned out to be cross platform and easily made thus giving at least the potential to get to both Borken and Münster in daylight, given also that it was another fine afternoon. It took four trains to get to Borken - 1313 Krefeld - Duisburg, 1355 Duisburg - Oberhausen, 1402 Oberhausen - Bottrop (this last a brand new junction station in a largely residential area) and 1431 Bottrop - Borken. The last two trains were 2 car and 4 car DMUs respectively. At Borken the line continued northwards across a level crossing [to Winterswijk in the Netherlands] but there are buffer stops just before the crossing. The station is much reduced with only one of the four platforms active but there is some evidence of freight traffic (though no wagons there today). Returning from Borken I changed at Dorsten in order to go on to Coesfeld and Münster. Dorsten is a slightly alarming station where you walk across the track of Gleis 1 Ost to get to Gleis 2 Ost. This successfully negotiated, the warmth of another DMU was very welcome. The junction between Coesfeld and Borken lines is at at Hervest-Dorsten, one station east fortunately, so no 'physical connection' problem. There is a large colliery on an industrial system near to Hervest-Dorsten station. The Borken branch diverges southwards and flies over the Coesfeld line just for added confusion. 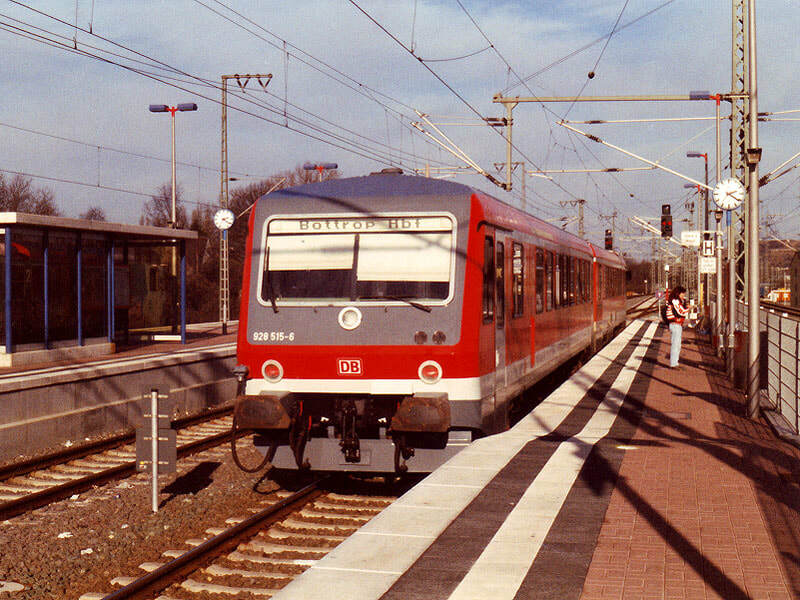 Coesfeld is a miracle of integrated transport - buses providing 'cross platform' interchange and all arriving just before 1700 to connect with the five trains arriving and departing between 1650 and 1704. Mr Prescott should observe. [Mr John Prescott was then the UK Minister for Transport]. Another DMU provided haulage to Münster - the gamble on daylight lasting worked out, as it was just fading as the train was held at signals outside Münster, just east of the point where the main line from Dortmund comes alongside. Arrival in Münster Hbf was about 5 minutes late by which time the daylight was, again, very technical. Connection into SE3428 to Gelsenkirchen was 20 minutes and once again a nice warm train was waiting in the platform. Not so at Gelsenkirchen, possibly the coldest and most shut place on earth, at least at 1910 on a February Sunday. An interminable 20 minutes wait for the 1931 SE to Krefeld, which was delayed waiting connections at Duisburg and was easily 3 minutes late into Krefeld (which was also shut). Alarm at 0620 with the intention of breakfast at the hotel and the 0743 to Essen. However the standard of the hotel was such that I decided to spend the DM5 for breakfast elsewhere. [A very unusual state of affairs for a German hotel, to be fair. The comments I noted at the time were somewhat more, er, comprehensive...]. Pausing only to pay the bill and give the manageress an opinion, I made the 0713 from Krefeld which did absolutely no good as I still had a long wait at Essen Hbf for the 0853 to Wuppertal. 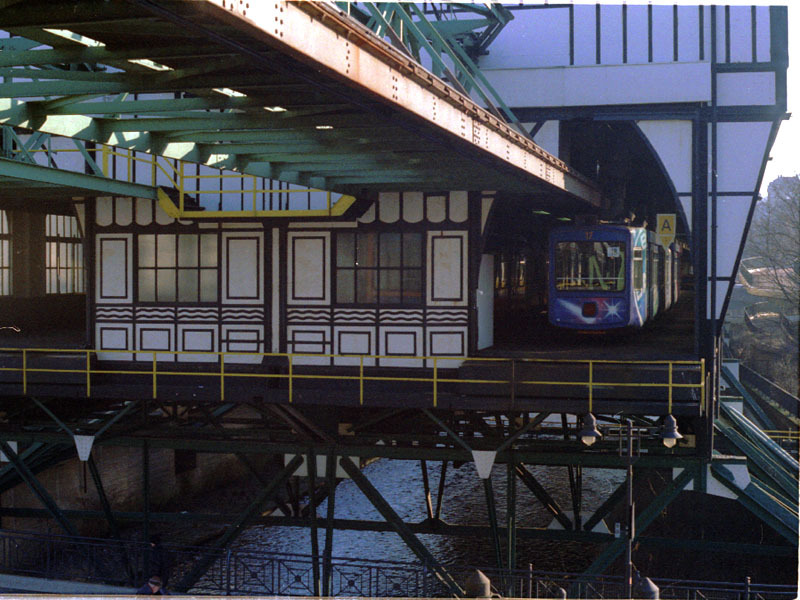 I had intended decamping at Wuppertal Vohwinkel to walk to the Schwebebahn station so as to do the whole line, however the line from Essen uses a low level platform before the physical connection, à la Wrexham, so I continued to Wuppertal Hbf to get the Schwebebahn thence to W- Oberbarmen. The 'Danglebahn' was well worth the effort. All suspended from a flattened and inverted V, the running rail is on top with current collection below. The cars ride about 25 ft up in the air, mostly over the river Wupper. The 'depot' is immediately beyond the end of the line at Oberbarmen; presumably fairly amazing things are done to transfer the cars to the opposite track. The Wuppertal Hbf - Vohwinkel stretch is a must for the future! The Essen - Vohwinkel line is quite picuresque for much of its length and well worth 3/4 hour of anybody's time. It appeared from the map at Vohwinkel that the Schwebebahn station is quite near. [It is - about 5 minutes walk]. 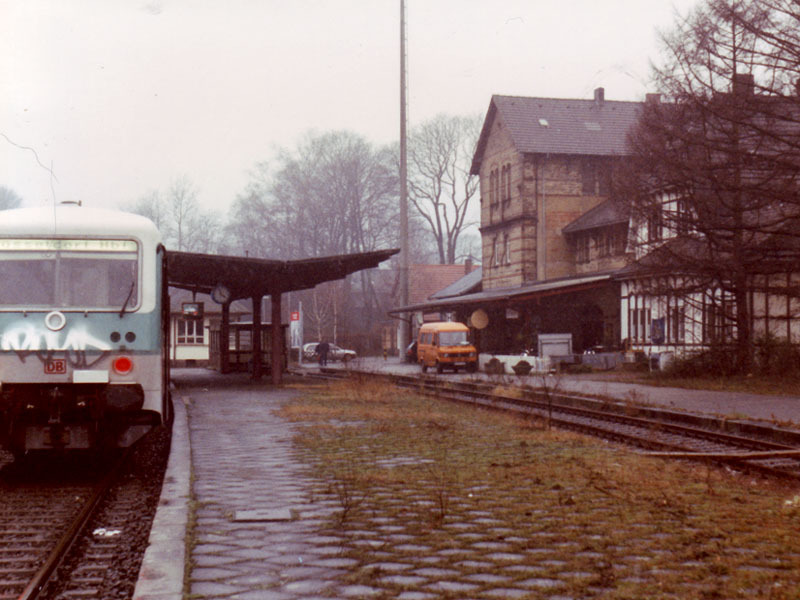 From Wuppertal Oberbarmen another DMU went round the line via Remscheid to Solingen-Ohligs. This is a fairly rural line, with a legendary high bridge (Müngstener Brücke) over the river Wupper. It was made better to look at by a light covering of snow and a very nice sunny morning. The 1125 S-Bahn from Solingen-Ohligs to Düsseldorf Hbf rounded off the day's track with a suburban trundle, and was followed by the 1158 S8 from Düsseldorf Hbf to Mönchengladbach Hbf where a ticket to Aachen was required. A ticket having been obtained from Rheydt to Aachen I decided to get the 1253 as far as Rheydt in the interests of complete propriety. There turned out also to be a 1256 IR and this all caused sufficient muddle for the 1253 to be held. Fortunately I realised this and retired to platform 5 in time to travel on the 1300 S6 as originally planned! Arrival at Aachen was more or less on time (1348). Despite previous doubts the Oostende - Köln and v.v. trains are maintaining their execrable timekeeping record. The 1400/1403 arrived at 1402, departed about 1408 and crawled as far as the border where currently (1416) it has been stationary for a few minutes. The train is virtually empty - presumably the service will soon disappear and Oostende will be a backwater served by a 3XX and 4XX shuttle from Brussel - or maybe some new service e.g. Liege or Charleroi to Oostende. [Not so far from the truth, with hindsight!]. The passing of a Thalys set eastbound at 1420 seems to have explained the delay and we have just lurched forward at 1422 and crossed to the left hand road through the tunnel. This is 'wrong line' since there's a flyover just west of the tunnel to achieve this for you! The 'real' westbound track is rusty so temporarily out of use presumably. Immediately west of the border is a stretch of several km where the westbound line is missing, with the overhead line supports removed by flame cutting in some places, and the southern span of a viaduct missing. There is a longer stretch where the westbound track is intact but unused. Double track resumes immediately east of Welkenraedt station (km 138.5 approx). Eventual arrival at Verviers Central was 22 minutes late at 1447. More track chaos at Angleur with the southern pair of tracks out of use across the junctions.The east-north chord is back in place but appears not to be in use yet. Arrival at Liege was still 22 late. There is much evidence of high speed line work between Ans and Fexhe-le-haut-Clocher with the high speed line seemingly using the old slow line alignment at Voroux, at least in part. Leuven was also reached 22 late - a pleasant surprise given the struggle that 1604 seemed to be having with the gradient between Liege and Ans. Brussel Noord was thoroughly cold and boring with nothing better to do than wait for the 1718 to the airport. Couldn't even sample the bars because of driving from Birmingham! Brussels airport is just as featureless and unpleasant as every other (the bigger the worse it would seem) but with a uniquely long walk to the departure gates (advertised as 10 minutes for B30 upwards). [I must up until that time have been lucky with my gates at Schiphol which also has a seriously long walk to some gates - but 20 years of cheap air travel later, these interminable trudges are an everyday feature of medium and larger airports]. Curiously, you pay less for your food and drink once past passport control than you do before you're a captive audience. An uneventful flight back (evening meal as poor as outward 'breakfast') arrived more or less punctually - baggage was waiting so plane to car was little over 10 minutes. Something to be said for regional airports! Three weeks later ADL ran a track and shed bash including Antwerpen Dam which I'd managed somehow not to visit previously. Thus it was that the car and I found ourselves on the way back to Belgium.